The wind family includes two special groups. Brass instruments (or horns) such as the trumpet, tuba and trombone and woodwind instruments. The woodwind group includes flutes, piccolos and whistles. It also includes reed instruments such as the clarinet, oboe, saxophone and bassoon, all of which have a mouth piece, or sometimes double reeds, which vibrate to produce their unique sounds. 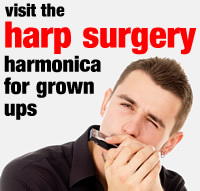 The harmonica is also a reed instrument, but it is part of an even smaller group. The reeds in this group are attached at one end, move freely at the other, but have nothing to vibrate against. We sometimes think of them as a mini diving boards. These are the free reed instruments. 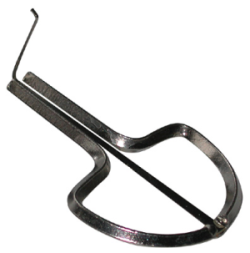 If we took one free reed and made an instrument with it, we would end up with a Jaws or Jews Harp. You sometimes hear its twangy sound in cowboy movies and cartoons. Reeds can be plucked or blown to produce a sound. Sometimes both. This free reed is mainly played by plucking. The Jaws Harp is held between the teeth or lips. This way the mouth cavity allows the sound to resonate naturally. If the player breaths in or out while plucking, the sound is amplified. It sounds louder. There are many forms of Jaws Harp from South-East Asia. In the Philippines for example, bamboo is used to create the Kubing. In Vietnam the Dan Moi is made of metal; sometimes from old bomb shells. If you’ve ever held a ruler on the edge of a desk and plucked it, you’ll know it makes a special sound. This is because the ruler is acting like a reed. You can hear it vibrating. The shorter the ruler, the higher the pitch of the sound and the harder it is to pluck. The longer the ruler, the lower the pitch and the easier it is to pluck. Whether blown or plucked, reed lengths respond in the same way when it comes to pitch. 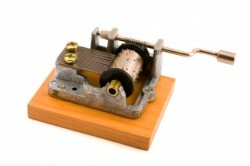 If we devised a a family of free reeds and a plucking mechanism, we’d have the components of a musical box. The bagpipes have been with us since biblical times. While closely associated with Scotland, their origins can actually be traced right across Europe and North Africa, and into the Middle East. This is an example of an instrument that makes its sound when a reed is blown, rather than plucked. 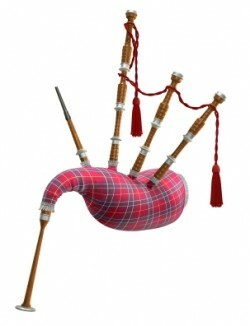 The bagpipes come with one reed, or two reeds, at the top of the Chanter. That’s the pipe at the bottom of the picture with finger holes used by a piper to play tunes. It’s a bit like a recorder. A great grandfather of the harmonica is the Sheng from China. Ancient pictures and relics of Shengs from hundreds of years BC have been found throughout China. 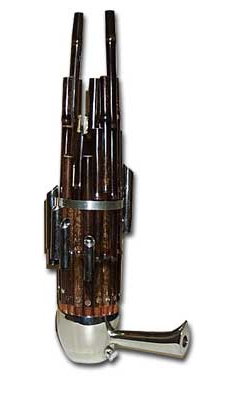 The Sheng is a collection of reeds, pipes and finger holes which connect to a bowl (or gourd) and one large mouthpiece. Just like the harmonica, the Sheng player breaths in and out to produce sounds. 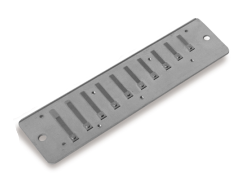 By covering the finger holes, each pipe can be sounded individually or in harmony. Some believe the Sheng was brought to Europe in the 1700s, where its technology was used to create reed organs and mouth organs. The Sheng can still be heard in China and other parts of South-East Asia such as Thailand, where it’s called a Naw, or Laos where it’s called a Khene. Swapping bellows for lungs. If we created a simple machine to blow air across a set of reeds for us, it would almost certainly involve a bellows. (Or else an air bag reservoir as with bagpipes). A squeeze-box does exactly this. By pushing or pulling a folded bellows and opening reed chambers with the help of finger buttons or keys, we can make some great music. Members of the squeeze-box family include the Harmonium, Concertina, Accordian and Bandoneon. 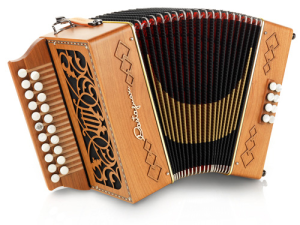 Another squeeze-box which uses exactly the same reed arrangement as a harmonica is the Melodeon (pictured). And here’s a surprise relative! The rubber squeeze-pump does the job of a bellows or human lungs. The metal trumpet projects the sound. Between the two is a small sound unit – the equivalent of a harmonica chamber containing a single reed. This reed makes one sound when the pump is squeezed, and another when the pump is released. A blow and a draw note, just like a harmonica, and a very practical use for the humble free reed.